Vernacular Christian Rhetoric and Civil Discourse seeks to address the current gap in American public discourse between secular liberals and religiously committed citizens by focusing on the academic and public writing of millennial evangelical Christian students. Analysis of such writing reveals that the evangelical Christian faith of contemporary college students—and the rhetorical practice motivated by it—is marked by an openness to social context and pluralism that offers possibilities for civil discourse. 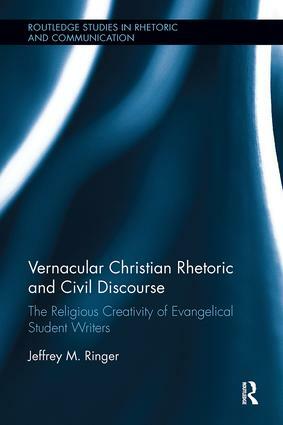 Based on case studies of evangelical Christian student writers, contextualized within nationally-representative trends as reported by the National Study of Youth and Religion, and grounded in scholarship from rhetorical theory, composition studies, folklore studies, and sociology of religion, this book offers rhetorical educators a new terministic screen that reveals the complex processes at work within our students’ vernacular constructions of religious faith. Jeffrey M. Ringer is an assistant professor of English at the University of Tennessee, Knoxville. He is the author of several articles and book chapters. With Michael-John DePalma, he edited Mapping Christian Rhetorics: Connecting Conversations, Charting New Territories, which won the Religious Communication Association’s 2015 Book of the Year award.